In 1992 Constable Hernandez was a member of the State Protection Group, and a qualified firearms instructor. He was accidentally shot in the chest whilst testing Police in their annual firearms proficiency tests at the Redfern Police Complex. Following emergency surgery, Constable Hernandez died at St Vincent’s Hospital Darlinghurst the same day of the accident.The Constable was born in 1959 and joined the New South Wales Police Service on 18 February, 1987. At the time of his death he was attached to the State Protection Group. Constable Brook died as a result of a self-inflicted bullet wound at the Bulli Police Station on 30 April, 1993. On 22 May, 1993, Sergeant Proops and Probationary Constable Katie Thompson went to a dwelling in Enfield to arrest the offender Smith for a breach of a Domestic Violence Order. The offender resisted arrest and during the ensuing struggle the Sergeant is thought to have suffered a heart attack. Constable Thompson attempted to revive the Sergeant, however she was unsuccessful. He was conveyed by Ambulance to the Western Suburbs Hospital where he was pronounced dead on arrival. He had survived a spear gun wound to the chest while attending a domestic violence dispute in 1976. The spear penetrated the police notebook in his left pocket and bruised his chest.The Sergeant was born in 1950 and joined the New South Wales Police Service on 20 February, 1967 as a Cadet. At the time of his death he was stationed at Enfield. At 2.30pm on 15 August, 1994, Senior Constable Tidyman was riding a Police motor cycle in the Lachlan Valley Way, Boorowa, when he was struck by an oncoming vehicle. As a result the Constable was fatally injured. At the time he was riding at the rear of a column of cycles in his capacity as a Police Senior Motor Cycle Instructor. The offending driver had apparently lost control of the vehicle before veering across the roadway and colliding with Senior Constable Tidyman’s cycle.The Constable was born in 1957 and joined the New South Wales Police Service on 8 December, 1980. At the time of his death he was attached to the School of Traffic and Mobile Policing, New South Wales Police Academy, Goulburn. On 17 March, 1995, Detective Nugter was driving a Police vehicle south along the Gilgai Road near Inverell. The rear wheel of the vehicle hit a gravel section on the shoulder of the road causing the Detective to lose control. The vehicle then collided with a tree, fatally injuring Detective Nugter.The Detective Senior Constable was born in 1961 and joined the New South Wales Police Service on 26 July, 1982. At the time of his death he was attached to the Physical Evidence Section at Inverell. On 8 June, 1995 Senior Sergeant George was riding a Police solo motor cycle from Goulburn to Sydney to attend a meeting. Whilst he was riding along Picton Road, near Almond Street, Picton, his cycle was struck by a motor vehicle. The Sergeant was thrown to the roadway where he was run over by a number of passing vehicles including a semi-trailer. He died as a result of injuries received.The Senior Sergeant was born in 1958 and joined the New South Wales Police Service as a Cadet in February, 1976. He was sworn in on 5 December, 1977. 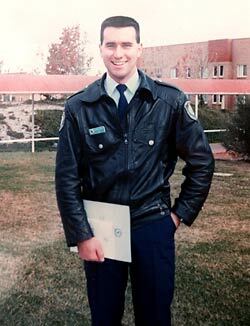 At the time of his death he was attached to the School of Traffic and Mobile Policing, Police Academy, Goulburn. Constable Carty died after being attacked in the car park of the Cambridge Tavern, Fairfield, in the early hours of April 18, 1997. The Constable was born in 1971 and was sworn in as a Probationary Constable in August, 1994. The 25-year-old had been out with other off-duty police after finishing his midnight shift. When he was leaving the tavern he was confronted by a group of men who fatally stabbed him in the chest and then kicked, punched and stomped on him as he lay dying on the ground. Gilbert Adam was found guilty of murder and sentenced to a maximum 28 years’ jail. His co-accused, brother Richard Adam, successfully appealed a sentence for inflicting grievous bodily harm and walked free. Amier Yaco, James George and Eshmail Esha were acquitted for their alleged parts in the attack. Edward Esho was sentenced to a maximum six years and eight months and Thamier Sako was given a maximum five years’ jail for inflicting grievous bodily harm. At the time the court was told Esho had been “chipped” by Constable Carty earlier in the evening and he later confronted the officer with two other men and incited the violence. David Carty is survived by his mother Lorraine, his father John and siblings Paul and Janine.